Greenmans on the Hawkesbury has a range of facilities that are available to guest to help make your stay enjoyable. We have single and double kayaks available to rent from our office. To reserve these for your stay please contact the office to book. We do not recommend swimming in the Hawkesbury due to possible sharks and underwater hazard. However we encourage you to take a dip in our small pool and relax on the seating provided around the fenced pool area. All children must be supervised as there are no lifeguards on duty. There are a number of great fishing spots at Greenmans on Hawkesbury, two of the best are off the wharves. For information on tides and bait visit the office. For those who do not have a BBQ or kitchen of their own there is the camp kitchen available for your use. The camp kitchen includes Gas BBQ’s, microwave and refrigeration. As this is a shared facility we ask that guest to clean the BBQ and microwave after use and to remove all food items from the fridge upon departure. Please note that the fridge is emptied every Tuesday. Part of the “getting away from it all” nature of Greenmans on the Hawkesbury is the limited mobile phone coverage. To help you stay in touch with the world we provide a coin operated public telephone. If your friends and family need to reach you in an emergency they can call the office and we will locate you. Shower and toilet amenities block. The caravans and tent sites are without their own amenities however there are two amenities blocks at the park. One larger block by the camp sites and a second by the caravans. Each contain separate male and female blocks with wheel chair accessible shower room and toilet in the main block. Guests to keep showers to no more than 3 mins and that children are supervised as the camp runs on tank water therefore there are limited water supplies..
We want your laundry to stay fresh and clean while holidaying with us so you can access the laundry which is open 24hrs. As well as basins there are two coin operated washing machines. The shop and office also provide credit card and eftpos facilities. One of the great pleasures of camping is sitting by a camp fire. Greenman’s on the Hawkesbury allows camp fires within the fire surround provided only. Non-combustible items are not permitted into the fires and guests are asked to check with the office on fire bans during the hot weather. And don’t worry if you have forgotten your marshmallows and biscuits for smoores, you can get some at the office! Parking is provided for those guest staying, though you may be asked to park you boat or car away from your site if it is too large for the site. You are welcome to purchase additional sites if required. Long term parking is also available, please see the office for monthly and annual rates. 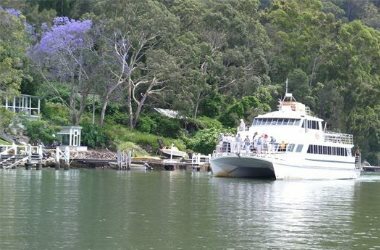 A full list of terms and conditions for guest ad visitors at Greemans on the Hawkesbury can be found here. In an emergency guests are asked to contact the office immediately. In the event of a fire the evacuation point the boat ramp. Deposits are required for all bookings. Deposits will be refunded once caravans or camp sites have been inspected. A full refund will be provided when greater than one weeks notice is received. A 50% refund will be provided if 48 hours notice is given. As there is wildlife throughout the park, pets of any kind are not permitted. on the park grounds. Please be consider of others when smoking elsewhere in the park. Cigarette butts are to be discarded in a suitable receptacle and not left on the ground. household white goods etc. these are to be taken home for disposal. Sheets are not supplied in caravans. Guests are asked to bring sheets and/or sleeping bags. Light doonas and pillows are provided. Leave the car at home and arrive by boat from Brooklyn.